I started at about 11 o'clock this morning by rinsing and soaking some sushi rice. Whilst the rice cooked I went to the polytunnel and picked the salad. When the rice was cool I rolled it in a sheet of dried seaweed called Nori. I then decorated mine and made some cheesey fish! It was quite difficult to get it right and I had to use one of Dad's sharp knives to cut the roll because a normal knife wouldn't. 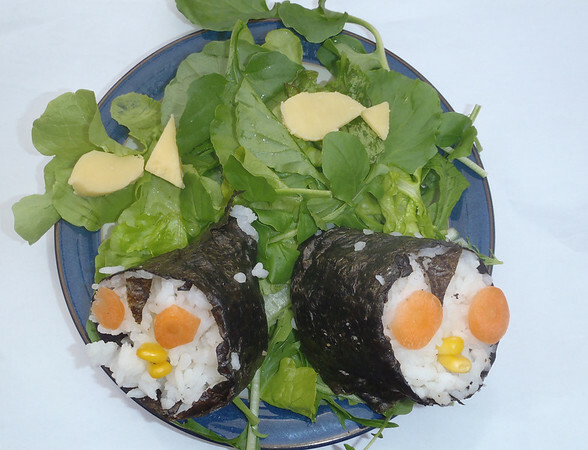 The eyes were to hard to make round out of Nori so I used carrot. I think it looks better the Dad's square eyes! What do you think? The rice was so sticky it held everyting together and the seaweed melted in your mouth. I really liked it as a packed lunch but if I was making it again I'd add much more carrot and cheese. 'We can select from a choice of three meals each day. My choice today was "Hefeklöße mit Vanillesoße" or how you would say Yeast dumplings with vanilla sauce. Usually they scatter poppy about it, but I don't like poppy on my dumplings. For dessert, we can always get something from a separate table. Today there were apples and vegetables. The drink (water) is free for all children. Our lunch price is - I think - 1,50 Euro, I think it's £ 1,21. I've not visited Germany yet so I can't imagine how a yeast dumpling tastes but you have given it a good food-o-meter and health rating so it must be delicious! Thank you for your support for Mary's Meals. We're now at 17% of a kitchen or 120 children feed for a year! Whoop! If you leave your email address when you donate I can write and say thank you. veg i think your penguins are great! very creative. you really do have a wonderful blog. one of my favourites. Great penguins by the way. It's a greenhouse :) We have a small green polytunnel too for cucumbers and tomatoes and strawberries. Had to look up what a polytunnel was - http://en.wikipedia.org/wiki/Polytunnel. Do you have a small one for the family, or larger that you share? What a lovely salad! You grow all of that? I love your penguins! I think your blog is adorable... I have your new posts emailed to me daily and really enjoy them. I work for a school in Hawaii called Kamehameha Schools and although I don't get a school lunch, I do love to photograph some of the delicious food I am eating. There are many kinds of Asian foods in Hawaii because there is such a mix of ethnicities on the islands. Sometime if I get a chance to get a school lunch, I will send a picture. Quite the winning penguin! I love the carrot eyes you have for your penguins! Wouldn't you say your Dad made a great effort? Lovely lunches! I'm following your blog quite a while now - and I really love it! Keep it up, girl. By the way: your penguins look fantastic - but the one from your dad are looking great, too=) It's very creative! Take care, lots of love from Münsterland, Germany. I love your blog and follow it frequently. Your penguins are adorable! I heard that you can use a hole punch to punch out eyes or different shapes on the nori. Keep up the great work! While it's obvious that Veg is an extremely bright, intelligent young lady, I think all of us that have raised children of that age know that there's no way Veg could keep up with this viral-blog without a lot of help. So a tip of the hat to you, Dad, for being willing to "put your money where your mouth is" so to speak, and putting in all those background hours. Hi! I'm Leire from Spain. My school is Artaza-Romo, I eat at school and all the people says that is the worse food in the world. haha interesting blog! I always read your blog in my English class. I love it. And you are only 9 yars old. Hi, My name is Patricia, I life in Spain and all our class visit your blog all the days in english class, because we like some much! Hi Veg! Two lovely sushi and salad is enough for you and your dad, huh? Ohh, btw, I think "yeast dumpling" is kind of like Chinese bread, it's steamed not baked though. It goes well with sweet sauce or sour cabbage. 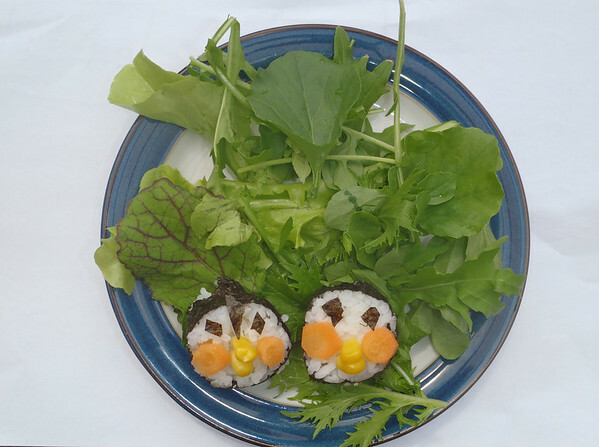 You and your dad made adorable sushi rolls. Maybe my boyfriend and I can try that out. Good to know a sharp knife is best used. Love the blog. Keep up the good work. i just came and ur nickname is Veg?? I'm impressed by your sushi! Have you tried it with some pickled radish rolled up inside (sometimes called yellow radish in asian food stores, but the whiter the better)? Hello there! I love your rice rolls but to make them even healthier I would recommend adding a bit of protein to them. Try some tuna and sweetcorn maybe? Or flaked salmon, if you like it. My mum is Japanese and she'd always add either some fish inside the rice or pickle inside and serve with a bit of meat or fish, then the meal is more balanced! Love the creativity and your enthusiasm for recording your school lunches though! Keep up the good work, and congratulations on raising so much for Mary's Meals! I'd like to send you a copy of time-travel mystery, Missing in Time by Catherine Harriott. 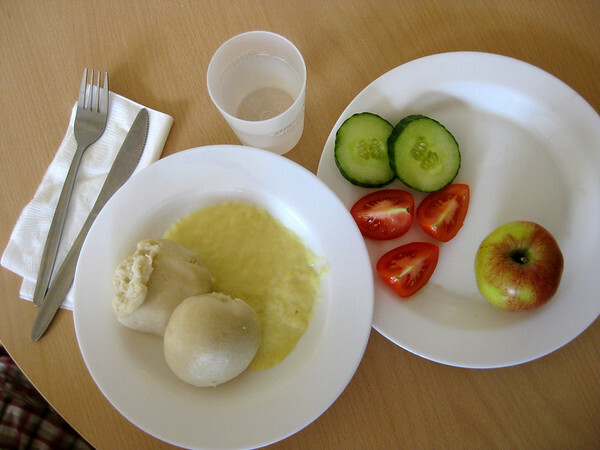 I've had yeast dumpling in Austria, they are yummy. Over there they have a sweet version that has strong plum jam inside, they're served with a custard like sauce and sprinkled with ground poppy seeds and sugar sprinkled over. I am a 9 year old Swedish girl living in England and I am very interested in you blog. How does the food have to be to get 10/10 in food-o-meter? Great blog kiddo. Keep it up and we will be checking out regularly. We are in Australia, and it is interesting to see what you take for lunch and what you get at school.